It doesn’t matter if you are keeping track of your carbs or not, these chops are wonderful! At least, my hubby thinks so! 1. Melt 2 tablespoons of the butter in a large, heavy skillet over medium heat. Brown the meat on both sides, about 4 minutes per side; transfer to a plate and keep warm. 2. Add the remaining butter to the skillet; add the onion, garlic and mushrooms. Sauté until the onion and mushrooms are limp. 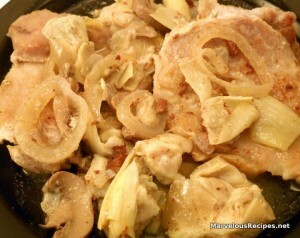 Add the artichokes, chicken broth and mustard; stir to dislodge the tasty brown bits on the bottom of the skillet. Return the pork chops to the skillet; cover and simmer for about 5 minutes. Serve the chops with the vegetables spooned over the top. Makes 4 servings each with 6 grams of carbohydrates and 2 grams of fiber for a total of 4 usable carbs and 25 grams of protein. I just made pork chops last night, I wish I would have made this instead of just plain!